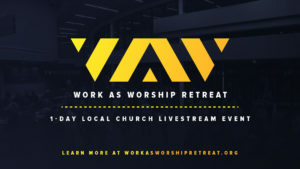 Friday, February 22, join us for the simulcast Work as Worship Retreat. The event takes place from 8:30 a.m. to 3:30 p.m. and lunch is included in your attendance ticket. The cost is $30 per person. Register by clicking here. We look forward to you joining us at this annual event.